The coastal gulf waters from just along the beach to several miles out offers numerous opportunities with fly or spinning tackle, particularly in spring and fall. My Action Craft flats boat, which will float and run in less than a foot of water will comfortable handle a chop of 2 feet or more that could be encountered in the gulf. 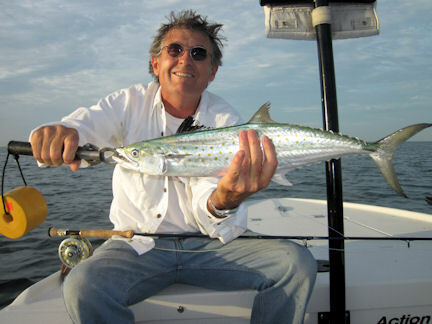 Tripletail, cobia, Spanish mackerel, bonito (little tunny) or barracuda are some of the fish that may be found in the gulf. Any of these fish can be targeted with fly or spinning tackle, but sight fishing with a fly is my favorite technique! We run along crab trap lines and search for cobia or tripletail that may be swimming around them. 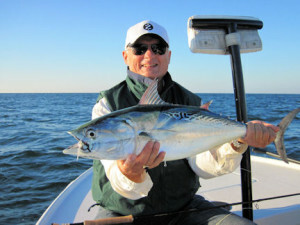 Another technique is to search for breaking fish or diving birds that may indicate Spanish mackerel or bonito. Bonito on a fly are awesome, striking like a freight train and peeling off 150 or 200 yards of line! In the absence of sight fishing opportunities, we would fish over structure for Spanish mackerel, bonito, cobia or cudas. 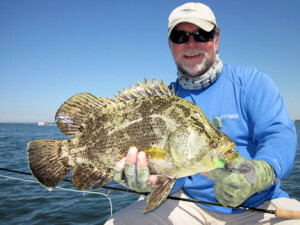 Since it is big, open water, weather is a factor when fishing the coastal gulf waters in a flats boat.